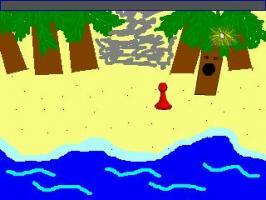 G P's Lost Adventure is about a Game Peice (G P) that is swept away from his game and turns up on a desert island. He then has to find his way home and avoid the obstacles that await for him! This is no game... the only "puzzle" is trivial, there's no character interaction, no places to explore, the music is terrible and makes the voices inaudible. The game is not even properly packaged: it contains three versions of the main EXE plus a fourth one inside a RAR archive. For what is worth, I played G P.exe which is the largest and most recent. I checked out one of the others and that was obviously and older (uncomplete) version. I can't believe that the same person had released a decent (as in playable) game like Test Rat Escape.